Anyone who has an interest in building a good body knows the importance of getting enough protein in your diet. Protein can come in many different forms, such as whey protein or from foods such as: chicken, eggs, nuts, etc. Protein is essential for both building muscle and fat loss. In this post, we will focus on protein bars. Protein bars are great because they help satisfy your sweet tooth while at the same time, they help you meet your protein goals. In this post we will be listing the top 10 protein bars you can buy. 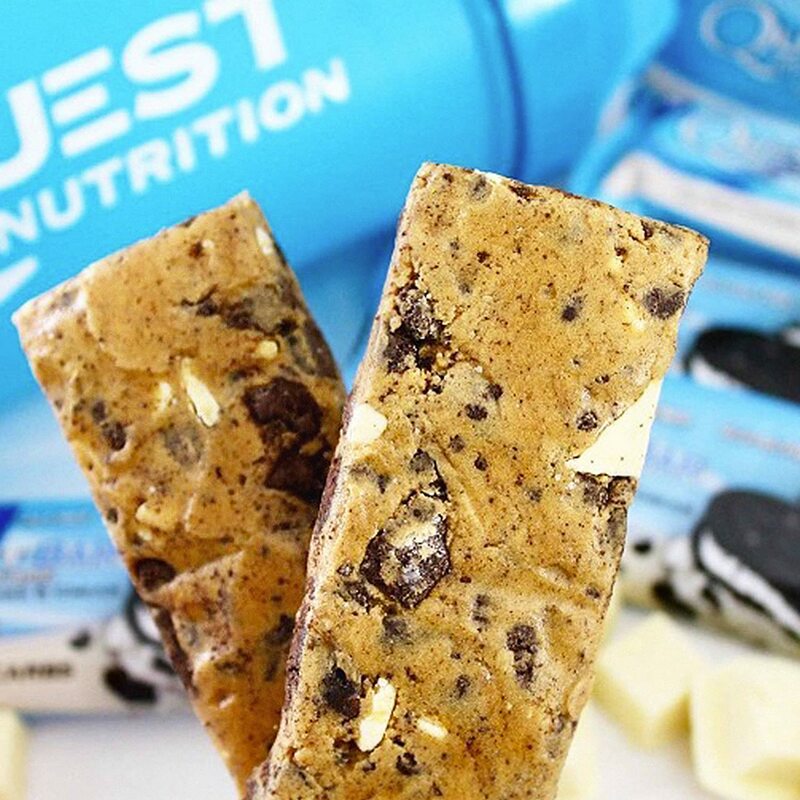 The quest nutrition protein bar is probably one of the best tasting protein bars out there on the market, it is also one of the most popular. It tastes incredible. It offers 21g of protein at only 190 calories, for those reasons it deserves the number one spot on the list. It’s made with both whey and milk protein isolates and contains real chocolate. This bar is great if you’re on a diet and want to meet your protein goals without limiting your calories too much. The Opti bar is another protein bar that tastes amazing and is one of the top 10 protein Bars for a reason. If you’ve had optimum nutrition protein shakes then you already know that this brand delivers great products. The Opti-bar comes in 7 different flavors including Chocolate Brownie flavor, chocolate chip flavor, and cookies N cream flavor. The protein bar offers a good source of fiber with 8-10g per bar. Also with 20g of protein and only 250 calories per serving the bar is certainly a good option for meeting your dietary requirements. Combat Crunch bars offer 20g of protein per 210 calorie serving. They include 12g of net carbs and 5 grams of sugar. The combat crunch bar comes in 7 different flavors including Birthday cake flavor, Chocolate cake flavor, and Chocolate Chip Cookie dough flavor. The only downside to this protein bar is that it is on the pricey side. However, it does taste great (not your typical rubber texture) and will fill you up. If you’re going for value for money out of the top 10 protein bars, the Promax protein bar is a great option. Each serving comes with 20g of protein and includes 18 vitamins and minerals. These protein bars are gluten free and are suitable for vegetarians if that’s something that applies to you. Also, this bar does not include any artificial sweeteners or preservatives which is another benefit. They also taste great. Each FitJoy Nutrition protein bar contains 220 calories. Within that, they contain 20g of whey protein and 13g of dietary fiber. They come in 6 different flavors. Including Chocolate Peanut Butter and French Vanilla Almond. These protein bars will satisfy your sweet craving and do fill you up. Definitely a good choice. Unlike most protein bars that come in packs of 12, the PowerBar comes in a pack of 15. These bars are great value for money. Each bar contains 20g of protein and tastes great. One downside to them is that they are not the most filling protein bars. But are great for in between meals if you want a quick snack. Each bar contains 3 different types of protein: whey, soy, and casein, which is useful for muscle recovery and lean muscle growth. These protein bars are great for those who want to put on lean muscle, or those who want to lose weight. Each protein bar is gluten-free and contains 0g of sugar. The protein per bar is also decent with 20g per serving. They are very filling and are a lot larger than most bars out there. For that reason, they do come in packs of 10 which is less than the usual 12 packs. We can’t have a list of the top 10 protein bars without the cliff energy bar. This bar is great for a pre-workout. It will give you the necessary energy and protein needed to maximize performance at the gym. The cliff energy bar comes in an impressive 24 different flavors so you will certainly find at least one that you love. Also, the bar includes 70% organic ingredients. Each Pure Protein bar contains 20g of protein. This variety pack gives you 6 bars of 3 different flavors (18 bars in total). The price is also very reasonable in comparison to other protein bars, and the taste is great, not too dry like some other protein bars on the market. They taste sweet even though the sugar count is very low, overall these are great protein bars that you should certainly try if you want both value and quality. To end our list of the top 10 protein bars, let us not forget the RXBar. This bar is made of whole foods. It only includes 6-8 whole food ingredients. There is no added sugar, no soy, no dairy and no gluten. Each bar contains 12g of egg white protein and 4g of fiber. These are great for in-between meals, or for breakfast. Each bar contains a reasonable 200 calories, and each box contains 12 protein bars. So if you’re looking for a bar that’s made of real food, then buy this one. As there are not many protein bars on the market that fit these criteria.